So I have enjoyed Pinterest quite a bit since I decided to sign up and start using it earlier this year. It’s definitely handy-dandy for lots of things. My youngest even knows that if we’re trying a new recipe, it’s most likely from Pinterest. I think, like a lot of other Pinterest users, I use the site for recipes, laughs, and just useful ideas about all kinds of things. Yes, it is delicious. But NOT 50 calories; no, it’s 500. But what has really gotten my goat over the months is noticing how much of it is just blatantly false. This is the case with “no-calorie” recipes of various kinds and with “fitspiration” pins. A few examples: the 50-calorie shake. The photo shows a delectable-looking glass filled with a thick, creamy chocolate shake. It always says “50 calorie shake” underneath the photo. I have now seen this repinned by friends at least four or five times. Every time I can’t help but comment on it. 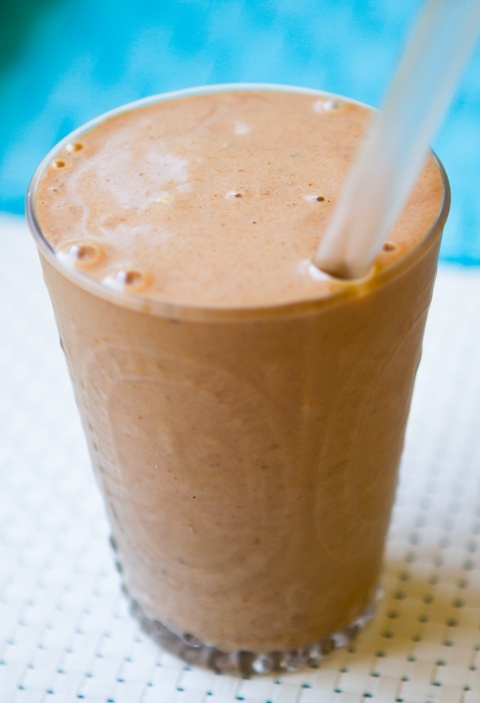 Because the truth is that the shake (if the whole recipe is imbibed) is 496 calories. Nearly 500. Not 50. If one wanted to have a 50-calorie version of this shake, that person would have to get out a shot glass, because she’d only be able to drink about 2 ounces. The original site doesn’t say anything about it being “diet” or low-calorie; it’s just a healthier way to have a “shake” than going to an ice-cream shop. There’s also the “no-calorie slushie.” The photo shows a glass with the final product, and there’s pictures of bananas and strawberries. If anyone were to think about it for just a second, she would know that bananas and strawberries HAVE CALORIES. The blogger admits that “her diet plan” doesn’t count fresh fruit or vegetables, but for those of us who do count everything (which I certainly think is a wise move), it’s about 250 calories. I’m thinking there’s a big difference between NO calories and 250. In fact, if one were to drink that no-calorie slushie every day without changing her diet in other ways, she’d gain half a pound a week. I think I’ve already mentioned the “fitspiration” pins. Beauty Redefined writes a fab blog post about those. Here’s the thing: it’s great to motivate yourself if you’re trying to take better care of your body by eating better and exercising. But the pins that show a ridiculously thin naked midsection with hip bones protruding, for example, are not going to help anybody. They tend to say “all you have to do to get these abs is follow this plan….” Honestly, I don’t care how much I worked my abs, I would never look like that. I’d also have to cut my calories to less than 1000 per day (not healthy) and get plastic surgery to get rid of the extra skin and the stretch marks to look like that. Can we sit back for a moment here and say, OK, I’d like to get healthier, but repinning this ridiculous photo isn’t going to help me or anyone? Yep. All lies. Why is it that we perpetuate them? I personally don’t repin these. I just don’t. If the recipe looks tasty and I’d like to try it, then I’ll repin it and give it an accurate title and caption: “fruity slushie,” for instance, or “protein-packed shake.” And even if I would like the tips for exercise, I just flatly refuse to repin those photos of tiny midsections. I’m not gonna do it. I don’t want to send the message out to my friends that image is paramount and flat abs are a holy grail. I don’t want my wonderfully normal friends to feel worried about their abs. Why should they? I also tend to make comments when friends pin some of these, just to correct the erroneous notions that are being sent along via the ever-so-simple pin. I imagine they are annoyed by me. Oh well. So I ask: if you’re a Pinterest user, are you going to breezily send the lies along for hundreds of other pinners to see, or are you going to stop them in their tracks? When you see a claim that seems “too good to be true,” it most likely is. Think about it for a second. Do some quick calculations. Go to the original post. Do something, but just don’t send it on! I’ve been trying to promote healthier eating and have noticed this unfortunate tendency to stretch the truth, even in my own recipes. I run my “skinny” recipes through eatracker and am always surprised at how quickly calories add up. It’s better just not to bake! Ha! Totally Cathy! I also love the bi-polar nature of Pinterest. I see it both when I browse and on friends boards…all the fit and exercise tips sitting next to decadent recipes. Makes me laugh. And then I sometimes I play a game with my husband called, “How long until I can spot these five kinds of pins on the Everything stream. For example 1. Exercise. 2. Recipe with nutella. 3. Link to a Mormon Mommy Blog (Follow suspicious link and poke around on the blog for proof) 4. Photography tips 5. Someone’s random naked or near naked baby. It never takes long. Who is writing their thesis on the societal norms, trends, social standing, self image and pinterest right now? I’m wondering if the Nutella people are out there secretly pinning tons of recipes to seed them somehow in the Pinterest community. 🙂 Yep, near-naked female bellies and baby bellies. Photography tips on capturing said bellies.